Mmmmm!!! Bakery lovers! Cake lovers! Angel Food Cupcake is the bomb!! I actually smelled this candle for the first time in a Bath & Body Works store but it wasn’t on sale at the time, so I forced myself to wait. I love this brand but I love these candles even more when they’re half price. It’s the only time I’ll buy them. This candle smelled like the sweetest white cake on the planet. White cake with sugary frosting. Cherry whipped cream? Cherry wasn’t noticeable on cold sniff but if that comes out once burning, I’m game. I had a feeling though this scent would be all cake and I was perfectly happy with that. I lit Angel Food Cupcake in my master bedroom to start out and soon after, moved it to a medium size room… and then to an even smaller room not long after that. I wanted maximum scent throw and a small room definitely hit the mark. The aroma… solid cake! Sweet, moist, white cake with zero frosting and it smelled delicious and super authentic. As far as cherry whipped cream – not a lick. This scent was all vanilla white cake and it was pretty darn yummy just as it was. My only wish – Bath & Body Works can somehow make it stronger the next round it’s released. I don’t have problems burning candles in small rooms but I kind of expect more from a 3 wick candle from Bath & Body Works. I’m used to room fillers. Which brings me to strength – I would rate Angel Food Cake a 4 out of 10 in a really large room. 6/7 in a medium and a 8+ in a small room. How did my Angel Food Cupcake candle burn? This candle burned perfect. Zero wick issues. YES!!! Clean burning from beginning to end. This is the 5th candle in a row that burned perfect. Dare I hope Bath & Body Works has fixed their drowning wick issue? Crossing fingers. 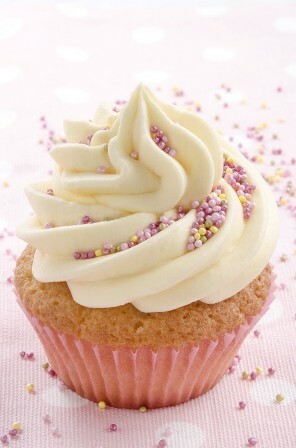 As far a cake scents go… Angel Food Cupcake was perfect and beyond authentic. This candle truly smelled like a freshly sliced piece of white cake. I do recommend it to all you bakery lovers out there. Just keep in mind it’s on the lighter side. If you give it a go, start in a small room and go from there. You’ll love it. 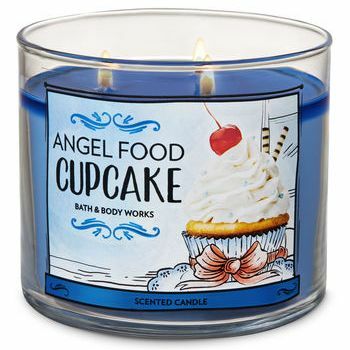 Don’t see Angel Food Cupcake on Bath & Body Works website, no worries. Try one of their stores which tends to carry all their current scents vs online.